The Cape Town Amateur Radio Centre will hold its annual Mega Flea market on Saturday, 5 March 2016. All are welcome to attend this very popular event on the Western Cape ham radio calendar. The venue, as always, will be the lawn in front of the CTARC clubhouse, directions to which are [here].. Participating radio hams who sell items from either their car boots or tables will be charged a nominal fee to assist with the expenses. Committee members are asked to be there at 12h00 to assist with setting up the event. In addition to all the interesting radio goodies for sale, we will hold a raffle and food, cool drinks and light beverages will be on sale. The annual flea market is always a very sociable event. We look forward to seeing you there! The Cape Town Amateur Radio Centre held it's monthly meeting at 14h00 on Saturday, January 23 2016 at the clubhouse. 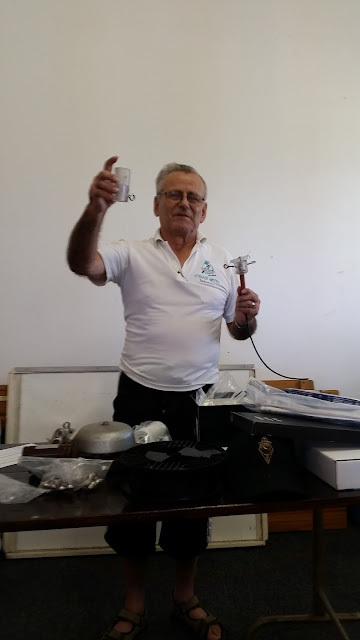 At the meeting, Klaus / ZS1QO gave an interesting talk on various ham radio-related subjects including antenna hardware and the latest tuner from MFJ. The clubhouse was packed to capacity and the talk well received. John / ZS1AGH and Elsabe were there, selling CTARC regalia. You too can have your personalised embroidered CTARC cap and / or T-shirt or golf shirt, all for very reasonable prices. John and Elsabe will be taking orders for these at subsequent CTARC meetings. All members have been asked to check their information on the Members List that is pinned on the notice board re contact details and birthday dates, and to change and update their information if necessary: This is the new birthday list the CTARC Bulletin Readers will use. This information will also appear in Ragchew on each membeers' appropriate birthday month. We look forward to the following meeting, which will be held on Saturday 27 February 2016 at 14h00 at the usual venue. Klaus / ZS1QO in action! Finally, a colour version has been developed, based on the colours of the SARL enamel badge. We will apply the new logo to the various CTARC documents and websites as time permits. We kick off our monthly members meetings of the Cape Town Amateur Radio Centre with the first one of the year, which will be held, as per tradition, on the fourth Saturday of the month. This January it will be the 23rd January, at 14h00, at the CTARC clubhouse. Directions to get to the CTARC clubhouse are [here]. At the meeting, Klaus / ZS1QO will give a demonstration on some of the latest amateur radio equipment. This promises to be a very interesting meeting indeed. A report back on the meeting will be posted to this blogspot in due course. The January 2016 edition of the Cape Town Amateur Radio Centre's bi-monthly newsletter "Ragchew" have been published. 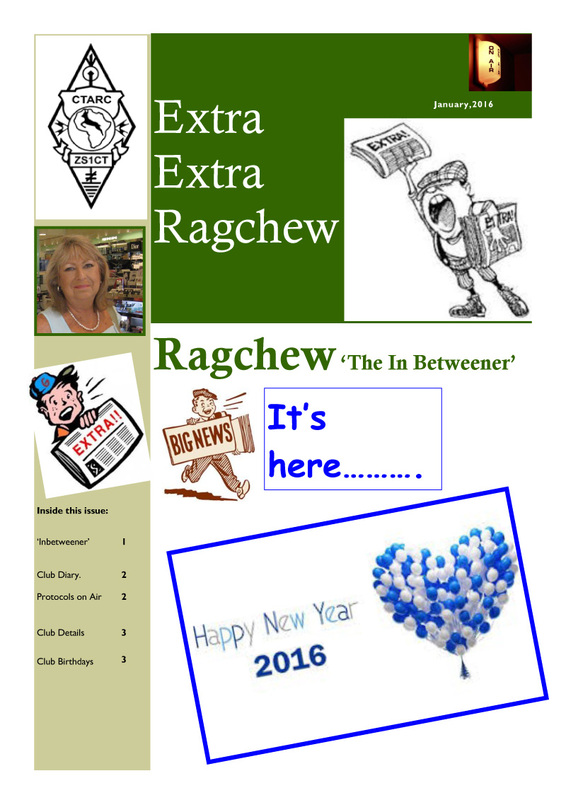 You can download the January Newsletter as a PDF directly from [here]. There will be a meeting for members of the CTARC committee, at 19h00 on Monday, 18 January 2016, at the CTARC Clubhouse. Our club's antennas and feed lines do require maintenance. To this end, periodic work parties are planned. Howevr, the work party planned for 16 January has been postponed until a later date (to be announced). Circumstances prevented enough people to be there on the day, and we need a minimum number of hands to assist with taking down antenna masts.